Sudan, Soudan, Mexico, Mexique, Middle East, Moyen-Orient, Asia, Asie, histoire urbaine, croissance urbaine, réseaux, religion, société urbaine, Hall Kenneth R.
These interdisciplinary studies address pre-1900 non-Western urban growth in the African Sudan, Mexico, the Ottoman Middle East, and South, Southeast, and East Asia. 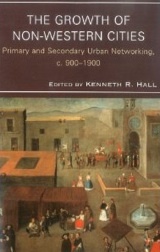 Therein, primary and secondary cities served as functional societal agents that were viable and potentially powerful alternatives to the diversity of kinship-based local or regional networks, the societal delegated spaces in which local and external agencies met and interacted in a wide variety of political, economic, spiritual, and military forms. They were variously transportation centers, sites of a central temples, court and secular administration centers, fortified military compounds, intellectual (literary) activity cores, and marketplace and/or craft production sites. One element of these urban centers' existence might have been more important than others, as a political capital, a cultural capital, or an economic capital. In the post-1500 era of increasing globalization, especially with the introduction of new technologies of transport, communication, and warfare, non-Western cities even more became the hubs of knowledge, societal, and cultural formation and exchange because of the location of both markets and political centers in urban areas. New forms of professionalism, militarization, and secular bureaucratization were foundational to centralizing state hierarchies that could exert more control over their networked segments. This book's authors consciously attempt to balance the histories of functional urban agency between the local and the exogenous, giving weight to local activities, events, beliefs, institutions, communities, individuals, and historical narratives. In several studies, both external and internal societal prejudices and the inability of key decision makers to understand indigenous reality led to negative consequences both in the local environment and in the global arena. Kenneth R. Hall is Professor of History at Ball State University. 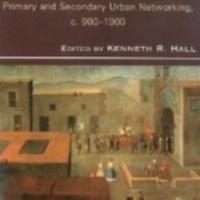 NC, “The growth of non-Western cities : Primary and secondary urban networking c. 900 - 1900,” Crévilles, consulté le 22 avril 2019, http://crevilles.org/items/show/24356.